There is little need to repeat here the many reasons why the election of Donald Trump to the presidency (or indeed any position of authority) would be a disaster. He has eminently disqualified himself by both his words and his actions, and I have little to add. And there are many reasons why Hillary Clinton should be elected, not simply in order not to elect Trump. Even her critics admit that she has the background and experience in both the executive and legislative branches of government – as First Lady (with an active role in policy discussions), as Senator from New York, and as Secretary of State for four years under President Obama – that few candidates for the presidency could match. Furthermore, even Donald Trump has said she is a fighter, and that is precisely what is needed if the policies that Obama has championed are to continue to move forward. A Clinton administration will fight for action to address global warming, to moderate health care costs, to improve education, to reform immigration, to re-build our infrastructure, and more, just in the domain of domestic policy. A Trump administration would move us backwards on each. And I far prefer an administration that takes pride in making decisions based on what is in their head, as Obama has done, rather than based on what is in their gut, as Obama’s predecessor was proud to brag of. As I write this, the polls indicate Hillary Clinton holds a substantial lead. That may unfortunately have the effect of leading some share of Clinton supporters (and Trump opposers) not to bother to vote on November 8. They may feel it would not matter, so why bother. But there are important reasons why all those supporting Clinton, who want the country to move forward rather than backward, need to make the effort to vote. This blog post will outline a few. a) Trump’s share in the vote might well be higher than what the polls indicate: As of October 23, an average of recent polls indicates that Clinton leads Trump by about 7 percentage points nationally. While in the US system the candidate receiving the most votes nationally is not necessarily the one elected (due to the electoral college system, so only the votes in a limited number of swing states decide the outcome, as discussed in this earlier blog post), a national margin of 7 percentage points is substantial and reflective of what is happening in the key states. But the final vote may well be different. First, it is common that there is a tightening in the race in the last few weeks of most American elections. There is a good chance this might happen again here. But second, and more fundamentally, it is important to recognize that the polls may not be assessing accurately the extent of Trump’s support. This is not due to any kind of conspiracy, or incompetence, but rather because polling this year is particularly difficult to do well. Trump is an especially controversial candidate, known for his racist as well as misogynist remarks in this campaign. Some Trump supporters might not admit to a pollster that they support him. His true support might be several percentage points higher than what the polls indicate, and there are indications that this may have been an issue during the polling for the primaries in at least some of the states. I am not saying that it necessarily is now, but rather that we just do not know. b) A focus by Trump on high turnout of his base, instead of a broadening of his base, is not an unreasonable strategy: Most major party candidates for the presidency seek to broaden their base of support as the election approaches by appealing to the middle. Trump has not done this. His focus has been and continues to be on energizing his base, with a continued use of extremist remarks to stoke concerns (the election is rigged, Hillary is a crook whom I will throw into jail, I won’t necessarily accept the results of the election unless they show I won, and so on). With a base of support that is well less than 50% (even if one discounts the polls to a significant extent; see above), such a strategy might be seen as making it impossible to win. The moderate middle is not attracted, but indeed repelled. But it is not necessarily an unreasonable strategy. The key is to recognize that a very high share of eligible Americans do not vote. In the 2012 presidential election, only 58% of the population that were eligible to vote in fact cast a ballot for the presidency. If Trump is able to energize his base and get a high share of them to vote, they can end up winning. This can be illustrated with some numbers. Using the polling averages as worked out by the Huffington Post, and rescaling to remove the undecideds, then as of October 23, polling indicated that Clinton would receive 48% of the vote and Trump 41% (with others receiving 11%, primarily Gary Johnson of the Libertarians and Jill Stein of the Greens). To arrive at these numbers, pollsters used various methods to try to take into account the likelihood that those being polled would actually vote. But none of these methods are very good. Some pollsters ask the individual whether they voted in the previous election. However, the share saying they voted is always substantially higher than the share we know actually did vote. Or some pollsters adjust the figures based on patterns for the share of those who voted in the past who have a similar income or education level, or are of the same ethnic group, or some other such grouping (using exit polling). But this also does not work very well since the share of different groups who vote changes from election to election depending on the candidates and other issues. Turnout matters. A strategy focussed on turning out a high share of your base supporters, by energizing them through extremist rhetoric with no suggestion of compromise, is not necessarily an irrational one, even if it means losing the more moderate voters. You could end up with more votes than your opponent. 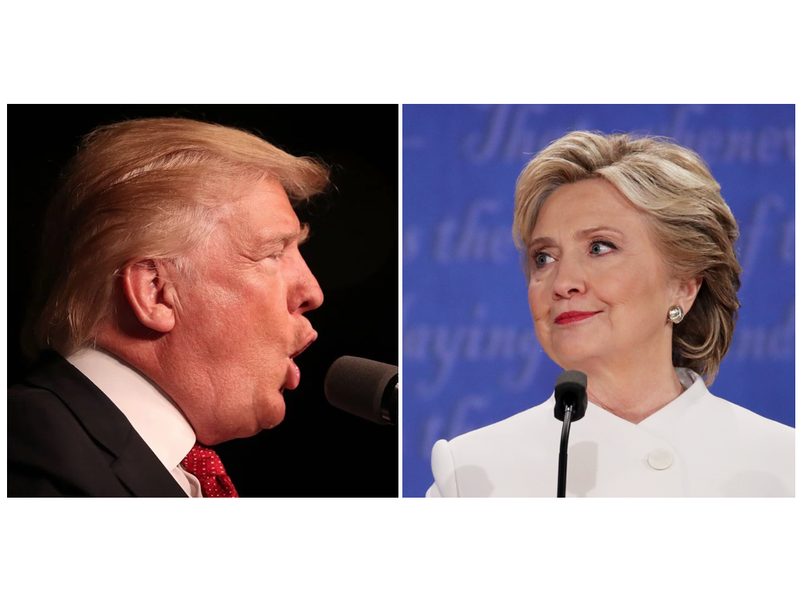 c) The winning margin matters for Trump to accept the result of the election: If Hillary Clinton wins the election, but by a relatively narrow margin, Trump has said that he will not necessarily accept the result. Trump made this clear in the third presidential debate, and has repeated his remarks since then despite of, and in the face of, strong criticism. An important strength of American democracy, which distinguishes it from what is seen in a number of other countries around the world, is that the loser of the election concedes and accepts the result. It might take some time (and court challenges) to determine the winner, but in the end the loser has always graciously accepted the decision (as Al Gore did in 2000). Trump has been intentionally ambiguous on whether he will. But the larger the margin by which he loses, the more difficult it will be for him to contest the results. d) The winning margin matters for the Republicans to move on: Trump has upended the national Republican Party by capturing a base, primarily of angry white males with less than a college education, who have said they are willing to take extreme measures to get what they want. If Trump loses, but by a relatively narrow margin, one can be sure that there will be Trump-like candidates seeking the Republican nomination in 2020, and perhaps even Trump himself. Strong supporters of the Democrats might feel that this may not be so bad. Such a candidate would likely lose again. But that would be short-sighted. Democracies need a multi-party system, with at least two responsible parties that can each govern responsibly. One-party states, whether in Japan or elsewhere, end up in difficulty. And one-party states are indeed rare. Eventually, an opposition party wins, as the electorate tires of those in power and as those long in power become increasingly ineffective. American democracy needs a responsible opposition party. Republicans at the national level are not providing that now, and that is a problem for all of us. e) The winning margin matters for Clinton to govern effectively: Everyone agrees that there is much that needs to be done. But opponents of the measures a Clinton administration would promote to move the country forward would be emboldened in their opposition should Clinton win by a relatively narrow margin. The larger the margin, the more difficult it will be for her opponents to block her proposals. f) There is an innate inconsistency to be opposed to Washington gridlock, but also to be in favor of divided government: Everyone agrees that gridlock in Washington is bad. The country needs to move forward in numerous areas, but gridlock is blocking it. At the same time, political scientists have long observed (and backed up in their research) that voters often prefer “balanced” government, where the executive branch is controlled by one party with the legislature by the other. This arrangement may have worked well in periods in the past. With the system of checks and balances built in to the US Constitution, one branch of government cannot change much alone, but must also receive the support of the other branches (with the judiciary playing an essential, but separate, role as well). This changed, however, over the last two decades. Rather than seek common ground on measures, with compromises in order to move things forward, Republicans in Congress decided to adopt a position of opposition. As documented in the excellent book of Thomas Mann and Norman Ornstein, It’s Even Worse Than It Looks, Republicans decided that if the administration supported something, they would be opposed. This applied even on measures that they themselves had originally proposed. The authors, one based at the left-of-center Brookings Institution and one at the right-of-center American Enterprise Institute, provide numerous examples. Such opposition continues. Last week, Senator John McCain (who at one time was considered a relative moderate among Republicans) said on a radio talk show that he and his colleagues will oppose any Supreme Court nominee of Hillary Clinton. He said “I promise you that we will be united against any Supreme Court nominee that Hillary Clinton, if she were president, would put up. … I promise you.” While a spokeswoman later sought to moderate his position, it does not appear that his views had in fact changed. Such an approach to government, of united opposition to any proposals put forward by the chief executive, can work in a different form of government. In parliamentary systems (such as in the UK), the opposition party will typically oppose any measures put forward by the prime minister. But the prime minister represents a majority in parliament, and hence with party line votes the measure will pass. But the US Constitution did not establish a parliamentary form of government. Rather, the system set up by the US Constitution has an independently elected president, along with certain powers assigned to the legislature (such as to make laws, pass a budget, provide “advice and consent” on judicial and senior executive branch appointments, and more). It is a system of checks and balances, and does not work well when one party decides to act like the opposition in a parliamentary system and routinely oppose measures proposed by the chief executive. A large winning margin by Hillary Clinton will make it more difficult for a Republican majority to continue to act in this way, at least at the start of the new administration. And while it is conceivable that the Democrats might win control of the Senate (they need to pick up a net of four seats, assuming Clinton wins so that Vice President Tim Kaine will have the tie-breaking vote), it is doubtful they will pick up the net of 30 seats required to win control of the House. Too many seats have been gerrymandered. Voters can resolve this by not voting for divided government, but rather for one party. And if that party is not to be the one with Trump as president, that means the Democrats. What will not resolve the issues would be to vote for Clinton, but then vote for Republican candidates for the House and the Senate, including those who have sought to keep their distance from Trump, with a number saying they will not themselves vote for Trump. But it is not really that vote that matters. What matters is the vote they will take for the leadership of the House or the Senate, and whether that leadership says that they will oppose anything being proposed by Clinton, as they have for Obama. If so, then gridlock will continue. It would be surprising if Hillary Clinton were not to win this election. I do not expect her to lose. But it should be recognized that it is possible. While the polls put her comfortably ahead as I write this, polls can be wrong, for reasons discussed above. And we have seen two major such cases already this year. Most expected British voters would reject the proposal in the June referendum to leave the European Union (Brexit). Most polls indicated the vote would be in favor of staying. Instead, it lost, and by the substantial margin of 52% to leave and 48% to stay. To be fair, the polls in the Brexit referendum were relatively close, especially just before the day of the vote. A better example of how the polls can be wrong in a major way was the vote in Colombia on October 2 on whether to accept the peace accord the government had negotiated with the FARC rebel army. The war had been going on for decades, and about 220,000 Colombians had died over the years. Polls before the vote indicated that over 60% of Colombians would vote in favor of the accord. But it narrowly lost, by 50.2% to 49.8%. It is not clear why, although there are many theories. But one important factor was turnout. Only 37% of eligible Colombian voters actually voted, perhaps because they believed the peace accord would win easily. Voter turnout was especially hurt along the country’s Caribbean coast, where a hurricane, while it remained off shore, nonetheless delivered heavy rains on the day of the vote. Support for the peace accord was especially high in that region, but turnout was low. I would not predict that the polls in the US presidential elections are wrong, but that there can be uncertainties. This is especially so this year. And, for reasons discussed above, the issue is not only who will win or lose, but also what the winning margin will be. So vote this November 8, and vote for Hillary Clinton.